VPN ゲートウェイとはWhat is VPN Gateway? VPN ゲートウェイは、特定の種類の仮想ネットワーク ゲートウェイで、パブリック インターネットを介して Azure 仮想ネットワークとオンプレミスの場所の間で暗号化されたトラフィックを送信するために使用されます。A VPN gateway is a specific type of virtual network gateway that is used to send encrypted traffic between an Azure virtual network and an on-premises location over the public Internet. VPN ゲートウェイを使用すると、Microsoft ネットワークを経由して Azure 仮想ネットワーク間で暗号化されたトラフィックを送信することもできます。You can also use a VPN gateway to send encrypted traffic between Azure virtual networks over the Microsoft network. 各仮想ネットワークには VPN ゲートウェイを 1 つだけ作成できます。Each virtual network can have only one VPN gateway. ただし、同一の VPN ゲートウェイに対して複数の接続を作成することができます。However, you can create multiple connections to the same VPN gateway. 同一の VPN ゲートウェイへの複数の接続を作成する場合、利用できるゲートウェイ帯域幅はすべての VPN トンネルによって共有されます。When you create multiple connections to the same VPN gateway, all VPN tunnels share the available gateway bandwidth. 仮想ネットワーク ゲートウェイとはWhat is a virtual network gateway? 仮想ネットワーク ゲートウェイは、作成する特定のサブネットにデプロイされる 2 台以上の仮想マシンで構成され、"ゲートウェイ サブネット" と呼ばれます。A virtual network gateway is composed of two or more virtual machines that are deployed to a specific subnet you create, which is called the gateway subnet. ゲートウェイ サブネットに配置される VM は、仮想ネットワーク ゲートウェイの作成時に作成されます。The VMs that are located in the gateway subnet are created when you create the virtual network gateway. 仮想ネットワーク ゲートウェイの VM は、ゲートウェイ固有のルーティング テーブルとゲートウェイ サービスを含むように構成されます。Virtual network gateway VMs are configured to contain routing tables and gateway services specific to the gateway. 仮想ネットワーク ゲートウェイの一部である VM を直接構成することはできません。また、ゲートウェイ サブネットに、その他のリソースをデプロイすべきではありません。You can't directly configure the VMs that are part of the virtual network gateway and you should never deploy additional resources to the gateway subnet. 仮想ネットワーク ゲートウェイの作成は、完了するまでに最大で 45 分かかる場合があります。Creating a virtual network gateway can take up to 45 minutes to complete. 仮想ネットワーク ゲートウェイを作成すると、ゲートウェイ VM はゲートウェイ サブネットにデプロイされ、指定された設定で構成されます。When you create a virtual network gateway, gateway VMs are deployed to the gateway subnet and configured with the settings that you specify. 構成する設定の 1 つは、ゲートウェイの種類です。One of the settings you configure is the gateway type. ゲートウェイの種類 "vpn" は、作成される仮想ネットワーク ゲートウェイの種類が VPN ゲートウェイであることを示します。The gateway type 'vpn' specifies that the type of virtual network gateway created is a VPN gateway. VPN ゲートウェイを作成した後、その VPN ゲートウェイと別の VPN ゲートウェイ間に IPsec/IKE VPN トンネル接続を作成するか (VNet 間)、VPN ゲートウェイとオンプレミスの VPN デバイス間にクロスプレミス IPsec/IKE VPN トンネル接続を作成できます (サイト間)。After you create a VPN gateway, you can create an IPsec/IKE VPN tunnel connection between that VPN gateway and another VPN gateway (VNet-to-VNet), or create a cross-premises IPsec/IKE VPN tunnel connection between the VPN gateway and an on-premises VPN device (Site-to-Site). また、ポイント対サイト VPN 接続 (VPN over IKEv2 または SSTP) を作成して、会議や自宅などの遠隔地から仮想ネットワークに接続することもできます。You can also create a Point-to-Site VPN connection (VPN over IKEv2 or SSTP), which lets you connect to your virtual network from a remote location, such as from a conference or from home. VPN ゲートウェイ接続は、特定の設定で構成された複数のリソースに依存します。A VPN gateway connection relies on multiple resources that are configured with specific settings. ほとんどのリソースは個別に構成できますが、一部のリソースは特定の順序で構成する必要があります。Most of the resources can be configured separately, although some resources must be configured in a certain order. リソースごとに選択した設定は、適切な接続を作成するうえで非常に重要です。The settings that you chose for each resource are critical to creating a successful connection. 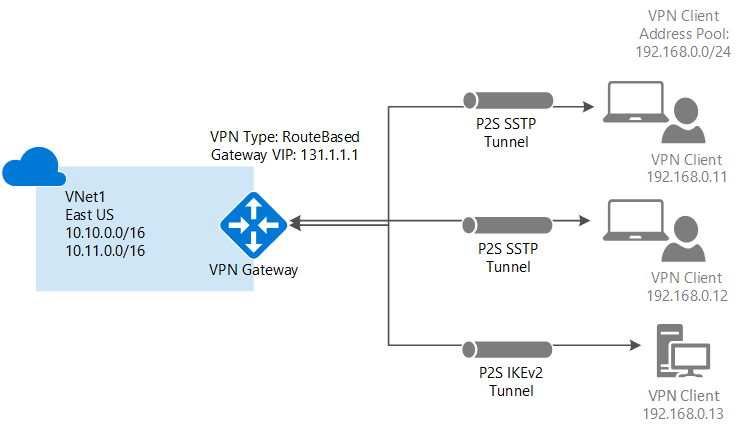 VPN Gateway の個々のリソースと設定については、「 VPN Gateway の設定について」を参照してください。For information about individual resources and settings for VPN Gateway, see About VPN Gateway settings. この記事には、ゲートウェイの種類、ゲートウェイの SKU、VPN の種類、接続の種類、ゲートウェイ サブネット、ローカル ネットワーク ゲートウェイ、検討が必要なその他のさまざまなリソース設定を把握するのに役立つ情報が記載されています。The article contains information to help you understand gateway types, gateway SKUs, VPN types, connection types, gateway subnets, local network gateways, and various other resource settings that you may want to consider. Azure Portal などの構成ツールをどれか 1 つ使用して、リソースの作成と構成を開始できます。You can start out creating and configuring resources using one configuration tool, such as the Azure portal. その後、追加のリソースを構成したり、適用できる場合に既存のリソースを変更したりするために、PowerShell などの別のツールに切り替えることができます。You can later decide to switch to another tool, such as PowerShell, to configure additional resources, or modify existing resources when applicable. 現時点では、すべてのリソースとリソースの設定を Azure Portal で構成することはできません。Currently, you can't configure every resource and resource setting in the Azure portal. 各接続トポロジの記事の手順では、特定の構成ツールが必要な場合が指定されています。The instructions in the articles for each connection topology specify when a specific configuration tool is needed. 現在、Azure には 2 つのデプロイ モデルがあります。There are currently two deployment models for Azure. VPN ゲートウェイを構成する手順は、仮想ネットワークの作成に使用したデプロイメント モデルによって異なります。When you configure a VPN gateway, the steps you take depend on the deployment model that you used to create your virtual network. たとえば、クラシック デプロイ モデルを使用して VNet を作成した場合は、クラシック デプロイ モデルに対応したガイドラインと手順を使用して VPN ゲートウェイ設定を作成し、構成します。For example, if you created your VNet using the classic deployment model, you use the guidelines and instructions for the classic deployment model to create and configure your VPN gateway settings. デプロイ モデルの詳細については、Resource Manager デプロイ モデルとクラシック デプロイ モデルについてのページを参照してください。For more information about deployment models, see Understanding Resource Manager and classic deployment models. 次の表は、ソリューションに最適な接続オプションを決定するのに役立ちます。The following table can help you decide the best connectivity option for your solution. 仮想ネットワーク ゲートウェイを作成するときは、使用するゲートウェイの SKU を指定します。When you create a virtual network gateway, you specify the gateway SKU that you want to use. ワークロード、スループット、機能、および SLA の種類に基づいて、要件を満たす SKU を選択します。Select the SKU that satisfies your requirements based on the types of workloads, throughputs, features, and SLAs. サポートされる機能、実稼働環境と開発テスト環境、構成手順など、ゲートウェイ SKU の詳細については、「ゲートウェイの SKU」を参照してください。For more information about gateway SKUs, including supported features, production and dev-test, and configuration steps, see Gateway SKUs. (*) 30 個を超える S2S VPN トンネルが必要な場合は、Virtual WAN を使用してください。(*) Use Virtual WAN if you need more than 30 S2S VPN tunnels. 合計スループット ベンチマークは、1 つのゲートウェイから集計された複数のトンネルの測定値に基づいています。Aggregate Throughput Benchmark is based on measurements of multiple tunnels aggregated through a single gateway. VPN ゲートウェイの合計スループット ベンチマークは、S2S と P2S を組み合わせたものです。The Aggregate Throughput Benchmark for a VPN Gateway is S2S + P2S combined. 多数のポイント対サイト接続がある場合、スループットの制限が原因でサイト間接続に悪影響が及ぶ可能性があります。If you have a lot of P2S connections, it can negatively impact a S2S connection due to throughput limitations. 合計スループット ベンチマークは、インターネットのトラフィックの状況とアプリケーションの動作に依存するため、保証されたスループットではありません。The Aggregate Throughput Benchmark is not a guaranteed throughput due to Internet traffic conditions and your application behaviors. これらの接続の制限は別々になっています。These connection limits are separate. たとえば、VpnGw1 SKU では 128 の SSTP 接続が利用できると共に 250 の IKEv2 接続を利用できます。For example, you can have 128 SSTP connections and also 250 IKEv2 connections on a VpnGw1 SKU. 料金情報については、価格に関するページをご覧ください。Pricing information can be found on the Pricing page. SLA (サービス レベル アグリーメント) 情報は SLA のページで確認できます。SLA (Service Level Agreement) information can be found on the SLA page. VpnGw1、VpnGw2、および VpnGw3 は、Resource Manager デプロイ モデルを使用する VPN ゲートウェイでのみサポートされます。VpnGw1, VpnGw2, and VpnGw3 are supported for VPN gateways using the Resource Manager deployment model only. Basic SKU はレガシ SKU とみなされます。The Basic SKU is considered a legacy SKU. Basic SKU には一定の機能制限があります。The Basic SKU has certain feature limitations. Basic SKU を使用するゲートウェイのサイズを変更し、新しいゲートウェイ SKU のいずれかにすることはできず、その代わり、新しい SKU に変更する必要があります。この場合、VPN ゲートウェイの削除と再作成が必要です。You can't resize a gateway that uses a Basic SKU to one of the new gateway SKUs, you must instead change to a new SKU, which involves deleting and recreating your VPN gateway. Basic SKU を使用する前に、必要としている機能がサポートされていることを確認してください。Verify that the feature that you need is supported before you use the Basic SKU. 図と説明を参考にして、要件を満たす接続トポロジを選択できます。Use the diagrams and descriptions to help select the connection topology to match your requirements. 図は主要なベースライン トポロジを示していますが、図をガイドラインとして使用して、より複雑な構成を構築することもできます。The diagrams show the main baseline topologies, but it's possible to build more complex configurations using the diagrams as a guideline. サイト間 (S2S) VPN ゲートウェイ接続とは、IPsec/IKE (IKEv1 または IKEv2) VPN トンネルを介した接続です。A Site-to-Site (S2S) VPN gateway connection is a connection over IPsec/IKE (IKEv1 or IKEv2) VPN tunnel. S2S 接続は、クロスプレミスおよびハイブリッド構成に使用できます。S2S connections can be used for cross-premises and hybrid configurations. S2S 接続では、オンプレミスの VPN デバイスが必要です。そのデバイスは、パブリック IP アドレスを割り当てられていて、NAT の内側に配置されていない必要があります。A S2S connection requires a VPN device located on-premises that has a public IP address assigned to it and is not located behind a NAT. VPN デバイスの選択に関する詳細については、VPN Gateway に関する FAQ の VPN デバイスに関する項目を参照してください。For information about selecting a VPN device, see the VPN Gateway FAQ - VPN devices. この種類の接続は、サイト間接続の一種です。This type of connection is a variation of the Site-to-Site connection. 仮想ネットワーク ゲートウェイから複数の VPN 接続を作成し、通常は複数のオンプレミスのサイトに接続します。You create more than one VPN connection from your virtual network gateway, typically connecting to multiple on-premises sites. 複数の接続を使用する場合は、(クラシック VNet を使用する際に動的ゲートウェイと呼ばれる) RouteBased という VPN の種類を使用する必要があります。When working with multiple connections, you must use a RouteBased VPN type (known as a dynamic gateway when working with classic VNets). 各仮想ネットワークに配置できる VPN ゲートウェイは 1 つのみであるため、ゲートウェイを経由するすべての接続は、使用可能な帯域幅を共有します。Because each virtual network can only have one VPN gateway, all connections through the gateway share the available bandwidth. この種類の接続は、一般に "マルチサイト" 接続と呼ばれます。This type of connection is often called a "multi-site" connection.
" ** " は、PowerShell が必要な手順がこの方法に含まれていることを示します。(**) denotes that this method contains steps that require PowerShell. "+" は、この記事がマルチサイト接続向けに書かれていることを示します。(+) denotes that this article is written for multi-site connections. ポイント対サイト (P2S) VPN ゲートウェイ接続では、個々のクライアント コンピューターから仮想ネットワークへの、セキュリティで保護された接続を作成することができます。A Point-to-Site (P2S) VPN gateway connection lets you create a secure connection to your virtual network from an individual client computer. P2S 接続は、クライアント コンピューターから接続を開始することによって確立されます。A P2S connection is established by starting it from the client computer. このソリューションは、在宅勤務の人間が自宅や会議室など、リモートの場所から Azure VNet に接続する場合に便利です。This solution is useful for telecommuters who want to connect to Azure VNets from a remote location, such as from home or a conference. P2S VPN は、VNet への接続が必要なクライアントがごく少ない場合に、S2S VPN の代わりに使用するソリューションとしても便利です。P2S VPN is also a useful solution to use instead of S2S VPN when you have only a few clients that need to connect to a VNet. S2S 接続とは異なり、P2S 接続には、オンプレミスの公開 IP アドレスまたは VPN デバイスは必要ありません。Unlike S2S connections, P2S connections do not require an on-premises public-facing IP address or a VPN device. P2S 接続と S2S 接続は、両者の構成要件がすべて両立する場合に、同じ VPN ゲートウェイを使って組み合わせて使用できます。P2S connections can be used with S2S connections through the same VPN gateway, as long as all the configuration requirements for both connections are compatible. ポイント対サイト接続について詳しくは、「ポイント対サイト VPN について」を参照してください。For more information about Point-to-Site connections, see About Point-to-Site VPN. 仮想ネットワークどうし (VNet 間) の接続は、VNet をオンプレミス サイトの場所に接続することと似ています。Connecting a virtual network to another virtual network (VNet-to-VNet) is similar to connecting a VNet to an on-premises site location. どちらの接続タイプでも、VPN ゲートウェイを使用して、IPsec/IKE を使った安全なトンネルが確保されます。Both connectivity types use a VPN gateway to provide a secure tunnel using IPsec/IKE. マルチサイト接続構成と VNet 間通信を組み合わせることもできます。You can even combine VNet-to-VNet communication with multi-site connection configurations. そのため、クロスプレミス接続と仮想ネットワーク間接続とを組み合わせたネットワーク トポロジを確立することができます。This lets you establish network topologies that combine cross-premises connectivity with inter-virtual network connectivity. Azure には現在、クラシックと Resource Manager という 2 つのデプロイメント モデルがあります。Azure currently has two deployment models: classic and Resource Manager. これまで Azure を使用してきているユーザーであれば、おそらく Azure VM およびクラシック VNet で実行されているインスタンス ロールを利用されていることでしょう。If you have been using Azure for some time, you probably have Azure VMs and instance roles running in a classic VNet. 新しい VM とロール インスタンスが、Resource Manager で作成された VNet 上で実行されていることも考えられます。Your newer VMs and role instances may be running in a VNet created in Resource Manager. VNet 間に接続を作成し、一方の VNet 内のリソースがもう一方の VNet 内のリソースと直接通信できるようにすることが可能です。You can create a connection between the VNets to allow the resources in one VNet to communicate directly with resources in another. 仮想ネットワークが特定の要件を満たしていれば、接続の作成に VNET ピアリングを使用することができます。You may be able to use VNet peering to create your connection, as long as your virtual network meets certain requirements. VNET ピアリングは、仮想ネットワーク ゲートウェイを使用しません。VNet peering does not use a virtual network gateway. 詳細については、「 VNet ピアリング」を参照してください。For more information, see VNet peering. "+" は、このデプロイ方法が同じサブスクリプションの VNet でのみ利用できることを示します。(+) denotes this deployment method is available only for VNets in the same subscription.
" * " は、このデプロイ方法では PowerShell も必要であることを示します。(*) denotes that this deployment method also requires PowerShell. ExpressRoute を利用すると、接続プロバイダーが提供するプライベート接続を介して、オンプレミスのネットワークを Microsoft クラウドに拡張できます。ExpressRoute lets you extend your on-premises networks into the Microsoft cloud over a private connection facilitated by a connectivity provider. ExpressRoute では、Microsoft Azure、Office 365、CRM Online などの Microsoft クラウド サービスへの接続を確立できます。With ExpressRoute, you can establish connections to Microsoft cloud services, such as Microsoft Azure, Office 365, and CRM Online. 接続には、任意の環境間 (IP VPN) 接続、ポイントツーポイントのイーサネット接続、共有施設での接続プロバイダーによる仮想交差接続があります。Connectivity can be from an any-to-any (IP VPN) network, a point-to-point Ethernet network, or a virtual cross-connection through a connectivity provider at a co-location facility. ExpressRoute 接続では、公共のインターネットを利用できません。ExpressRoute connections do not go over the public Internet. それにより、ExpressRoute 接続はインターネット経由の一般的な接続に比べて、安全性と信頼性が高く、待機時間も短く、高速です。This allows ExpressRoute connections to offer more reliability, faster speeds, lower latencies, and higher security than typical connections over the Internet. ExpressRoute 接続では、仮想ネットワーク ゲートウェイが必要な構成の一部として使用されます。An ExpressRoute connection uses a virtual network gateway as part of its required configuration. ExpressRoute 接続では、仮想ネットワーク ゲートウェイは "Vpn" ではなく "ExpressRoute" というゲートウェイの種類で構成されます。In an ExpressRoute connection, the virtual network gateway is configured with the gateway type 'ExpressRoute', rather than 'Vpn'. ExpressRoute 回線を経由するトラフィックは既定では暗号化されませんが、ExpressRoute 回線経由で暗号化されたトラフィックを送信できるソリューションを作成することができます。While traffic that travels over an ExpressRoute circuit is not encrypted by default, it is possible create a solution that allows you to send encrypted traffic over an ExpressRoute circuit. ExpressRoute の詳細については、「 ExpressRoute の技術概要」を参照してください。For more information about ExpressRoute, see the ExpressRoute technical overview. 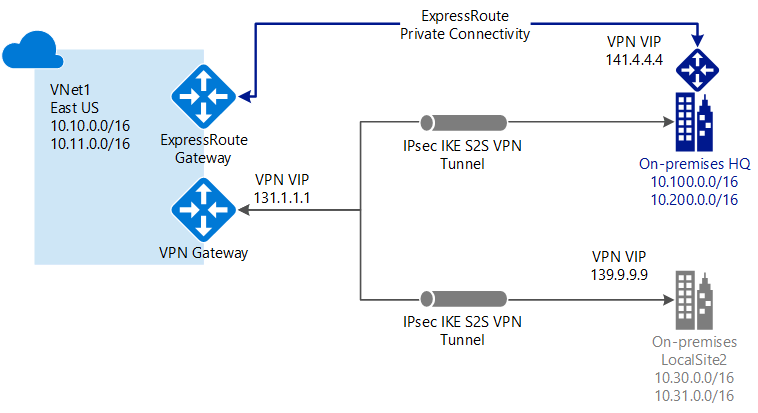 ExpressRoute は、パブリックなインターネットを経由せずに WAN から Azure などの Microsoft サービスに直接アクセスする、プライベート接続です。ExpressRoute is a direct, private connection from your WAN (not over the public Internet) to Microsoft Services, including Azure. サイト間 VPN トラフィックは、暗号化が施されたうえでパブリック インターネット経由で送受信されます。Site-to-Site VPN traffic travels encrypted over the public Internet. 同じ仮想ネットワークに対してサイト間 VPN と ExpressRoute 接続が構成可能な場合、いくつかの利点があります。Being able to configure Site-to-Site VPN and ExpressRoute connections for the same virtual network has several advantages. ExpressRoute 用にセキュリティで保護されたフェールオーバー パスとしてサイト間 VPN を構成したり、サイト間 VPN を使用して、ネットワークの一部ではないものの、ExpressRoute 経由で接続されているサイトに接続したりすることができます。You can configure a Site-to-Site VPN as a secure failover path for ExpressRoute, or use Site-to-Site VPNs to connect to sites that are not part of your network, but that are connected through ExpressRoute. この構成では、同一の仮想ネットワークに 2 つの仮想ネットワーク ゲートウェイが必要なことに注意してください (1 つのゲートウェイの種類は "Vpn"、もう 1 つのゲートウェイの種類は "ExpressRoute")。Notice that this configuration requires two virtual network gateways for the same virtual network, one using the gateway type 'Vpn', and the other using the gateway type 'ExpressRoute'. 料金は 2 つの要素に対して課金されます。1 つは仮想ネットワーク ゲートウェイに対する時間単位のコンピューティング コスト、もう 1 つは仮想ネットワーク ゲートウェイからのエグレス (送信) データ転送のコストです。You pay for two things: the hourly compute costs for the virtual network gateway, and the egress data transfer from the virtual network gateway. 料金情報については、価格に関するページをご覧ください。Pricing information can be found on the Pricing page. 仮想ネットワーク ゲートウェイごとに時間単位のコンピューティング コストが課金されます。Each virtual network gateway has an hourly compute cost. 料金は、仮想ネットワーク ゲートウェイを作成する際に指定するゲートウェイ SKU に基づいて決定されます。The price is based on the gateway SKU that you specify when you create a virtual network gateway. コストは、ゲートウェイ自体にかかる料金と、ゲートウェイを通過するデータ転送にかかる料金を足した額になります。The cost is for the gateway itself and is in addition to the data transfer that flows through the gateway. アクティブ/アクティブ セットアップのコストは、アクティブ/パッシブの場合と同じです。Cost of an active-active setup is the same as active-passive. データ転送のコストは、ソース仮想ネットワーク ゲートウェイからのエグレス トラフィックに基づいて計算されます。Data transfer costs are calculated based on egress traffic from the source virtual network gateway. オンプレミスの VPN デバイスにトラフィックを送信する場合は、インターネット エグレス データ転送率を使用して課金されます。If you are sending traffic to your on-premises VPN device, it will be charged with the Internet egress data transfer rate. 異なるリージョンに属する仮想ネットワーク間でトラフィックを送信する場合は、リージョンごとの価格に基づいて課金されます。If you are sending traffic between virtual networks in different regions, the pricing is based on the region. 同じリージョンに属する仮想ネットワーク間でトラフィックを送信する場合は、データ コストはかかりません。If you are sending traffic only between virtual networks that are in the same region, there are no data costs. 同じリージョン内にある VNet 間のトラフィックは無料です。Traffic between VNets in the same region is free. VPN ゲートウェイの SKU の詳細については、「ゲートウェイの SKU」を参照してください。For more information about gateway SKUs for VPN Gateway, see Gateway SKUs. VPN Gateway に関してよく寄せられる質問については、「VPN Gateway に関する FAQ」を参照してください。For frequently asked questions about VPN gateway, see the VPN Gateway FAQ. 詳細については、「VPN Gateway に関する FAQ」を参照してください。View the VPN Gateway FAQ for additional information. サブスクリプションとサービスの制限に関するページを参照してください。View the Subscription and service limits.